One of the Tornado Fleet boats Mistral gives an opportunity to explore the Red Sea. 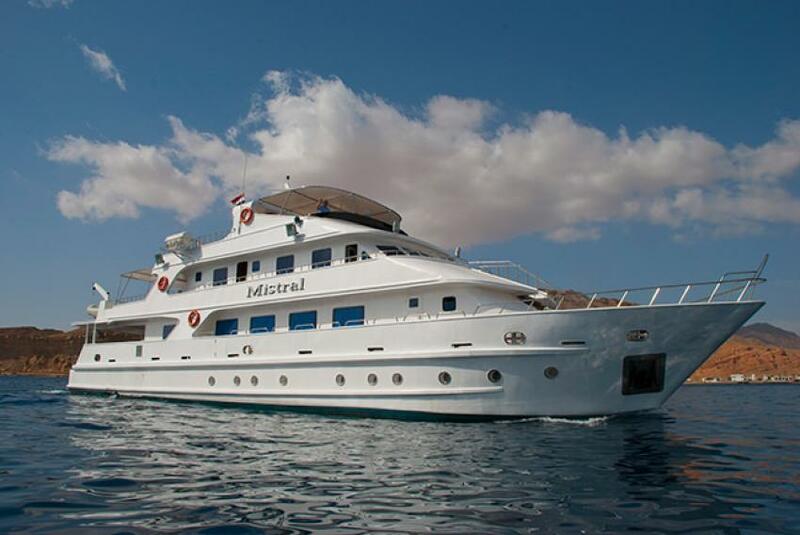 Mistral Liveaboard has 10 cabins that can accommodate 20 passengers. Double cabins are located on the upper deck and twin bed rooms are on the lower deck. All cabins supplied with air conditioning and private showers and storage facilities. Time in between and after dives Mistral guests can spend a the boats salon, that equipped with cozy sofas, TV, and DVD. Another comfortable zone on a board of Mistral that allows relaxing after diving is sun deck. it has numerous of sun loungers and a shaded part. For more comfort boat ahs a jacuzzi. Dive deck of Mistral Liveaboard is spacious, equipped with storage boxes for the gear and rinsing tanks to maintain it after diving. For underwater photographers, there is a separate room to work with cameras. To ensure safety on board Mistral equipped with first aid kit, emergency rafts, and life vests. Itineraries that Mistral offers is mostly dedicated to an exploration of wrecks. While the safari divers will get a chance to visit Abu Nuhas. This dive spot consists of five ships sunken in a different time on a different depths. Some of them can be explored from the inside. Mostly they are available only for divers with experience. Another famous wreck that included in a trip is Thistlegorm. You can see guns, motorbikes, trucks that lie on its board. Rosalie Moller also can be visited. It is possible to penetrate the holds, but is not really necessary, as the most interesting parts of the wreck are visible from the outside. Mistral has eight twin cabins on the lower deck. Each cabin has an en-suite bathroom, individual controlled A/C, safety deposit box, and bedside controlled music and lighting. The lower cabins have a large double lower bunk, and a single upper bunk bed. All cabins have ample storage space and vanity unit space. Mistral has four spacious double cabins located on the upper deck. Each cabin has an en-suite bathroom, individual controlled A/C, safety deposit box, and bedside controlled music and lighting. The upper cabins have one large double bed. All cabins have ample storage space and vanity unit space.